This was one of the Polar Vortex images from last year. 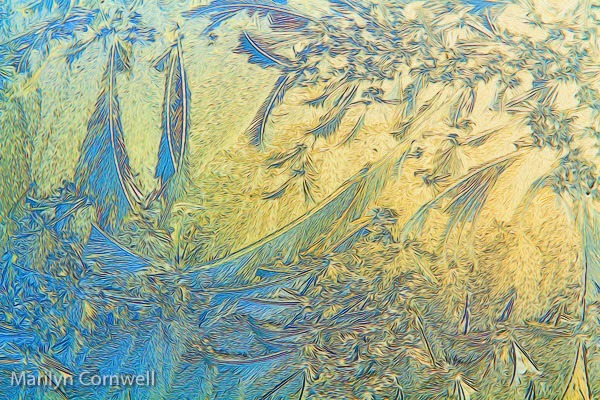 The temperatures were so low that frost built up in complicated patterns on the conservatory glass. These pictures were taken at the end of the day when the sun was low over the escarpment and starting to set. The image has been processed with a new filter available from Topaz Labs named 'Glow'. It creates squiggly and electrified lines. I hadn't thought of this before - if we lived in the southern hemisphere today will be their summer solstice. The solstice has a time occurrence - this year 11:03pm UTC when it seems to stand still at the Tropic of Capricorn and then reverses its direction. So this picture celebrates the Solar Day and the return of the sun thereafter.